My roots in the crypto community go way back to a significant stint at RSA Security where I had the privilege of working with leading researchers like Ari Juels and Markus Jakobsson who contributed significantly to the development of hashing based “proof of work” long before blockchain and cryptocurrencies took off. And yet, I missed the early rise of blockchain technology in the form of cryptocurrencies and fat protocols — primarily because I was focused on investing in emerging markets post 2008, but equally because I did not fully realize the impact trustless decentralized computing could have. But now I am a believer in blockchain technology (not the same as cryptocurrencies) and as we approach the end of 2017 — was this the real year of the blockchain?- I wanted to share my thoughts on how any tech investor could be thinking about this paradigm shift in technology. There are several primers out there on blockchain and cryptocurrencies — often used interchangeably, incorrectly — so I will not try to put forth another one here. Further, this post is not intended to be a guide to investing in cryptocurrencies (like Bitcoin), or the mechanics of investing in tokens/ICO, or a framework for professional investors to map tokens against existing equity investing paradigms. However, we do need a framework for thematic investing in a complex set of rapidly evolving technologies that could collectively redefine almost every industry. I assume some familiarity with the technology as I put forth one such framework here, but there are other good ones which may serve you well. At its core, I see three layers of opportunity for value creation and capture and, for some amusement, I will try to shoehorn clichéd analogs from the original California Gold Rush relevant to this new gold rush into each one of them. Investing in blockchain related companies on a portfolio basis via Application Tokens or in Protocol Tokens is best handled by sophisticated investors (high net worth individuals, VC funds, family offices, hedge-funds, etc.) delving into this emerging and highly risky asset class. My friends at Pillar VC have put out some good analysis of why token investing can make sense to such investors and how. This fourth layer does not directly relate to the tech stack and is out of the scope of this write up. A commonly held and reasonable view of why blockchain investing makes sense is that the technology is transformational on the scale of what the Internet did for businesses over the past twenty-four years, and possibly a lot more so. Back in 1993, with advent of the first web browsers everything from retail to email to information search went online and this has shifted market power greatly towards the providers and users of such technology. The Internet era of the past 20 years was built on connectivity: anybody in the world could transact with anybody else, but primarily through large platforms that act as intermediaries and aggregators. Blockchain promises to re-arrange that leaderboard in the next ten to twenty years by introducing a new technology paradigm: trustless decentralization. This removes intermediaries and institutional boundaries like countries, regulators, financial networks, and macro-economic policies as we know them. But just like the Internet boom of the dot-com-era (late 1990s) we are seeing a lot of hype, euphoria, and speculative buying of securities scarcely anybody understands. By most anecdotal estimates, less than 3% of blockchain tokens are actually being used to buy goods or services or real assets. Which means although we are all excited about a global network of blockchain nodes relaying ledger updates to each other for performing real world transactions, in reality, what we have today is a global network of nodes at exchanges and wallets that store tokens in the hope that their value increases. 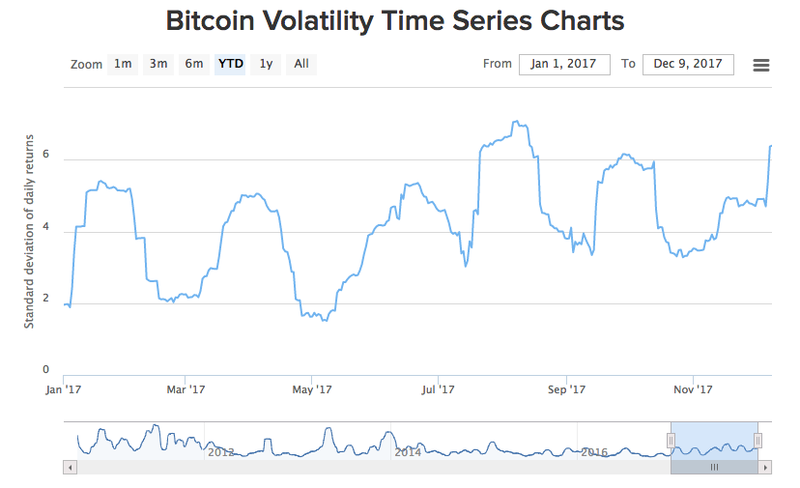 That is a classic recipe for volatility and we have already seen a lot of it — and it is not unrealistic to assume that there will be decimation of the market caps of a lot of these tokens/coins at some point soon. Some of the volatility we see is because the nature of crypto token value is not very well understood and sentiment moves wildly in this vacuum of knowledge. Tokens are the fundamental unit of investment in the blockchain today and pricing (today) is not based on “intrinsic value” (a measure of its utility in some context) but on “perceived value” (what a buyer is willing to pay). Although gold is no different in that it has more “historical value” than “intrinsic value” today, its “perceived value” is much better understood than that of crypto tokens. The lack of confidence in token pricing also stems from insufficiently repudiated claims of fraud and price manipulation in the absence of any kind of regulation. More recently, the SEC has stepped up policing of ICOs, but as a whole, the sector is mostly devoid of regulation. Your best opportunity for investing in the blockchain is probably going to be defined by: who you are AND your appetite for risk. But the risk vs. return profile of the asset class is currently so asymmetrical that everyone of us should be looking at allocating some portion of a diversified portfolio to this sector. The risks are high enough that it should be at a level where you would not mind losing your capital completely (perhaps the amount you would spend on a completely discretionary/whimsical purchase). While reports have been pouring in of Thanksgiving dinner conversations this year leading to retirees investing in cryptocurrencies, like much else at the feast, this is probably not healthy except in moderation. But the average retail tech investor could still make a play at blockchain based returns. While you could invest in BTC at $17000 or ETH at $500 this week it may leave you wondering about headroom for growth after recent run ups. There are other options: one of the 300+ other app tokens now listed on exchanges or looking to list via so called Initial Coin Offerings (ICOs) (also called crowd sales or token sales) will allow you to experience the uncertainty, volatility, and potentially significant upside, for a lot less. But making sense of the white papers (similar to an IPO “prospectus” but not regulated to enforce any kind of information disclosure standards) associated with each of these app tokens is non-trivial. Meanwhile, both the CBOE and Tokyo’s futures markets are going to allow trading in BTC futures so for more adventurous investors that is another avenue to play the markets. Those who would like to “draft” in the wake of the blockchain boom, without actually buying directly into it, may want to look at the Infrastructure layer. 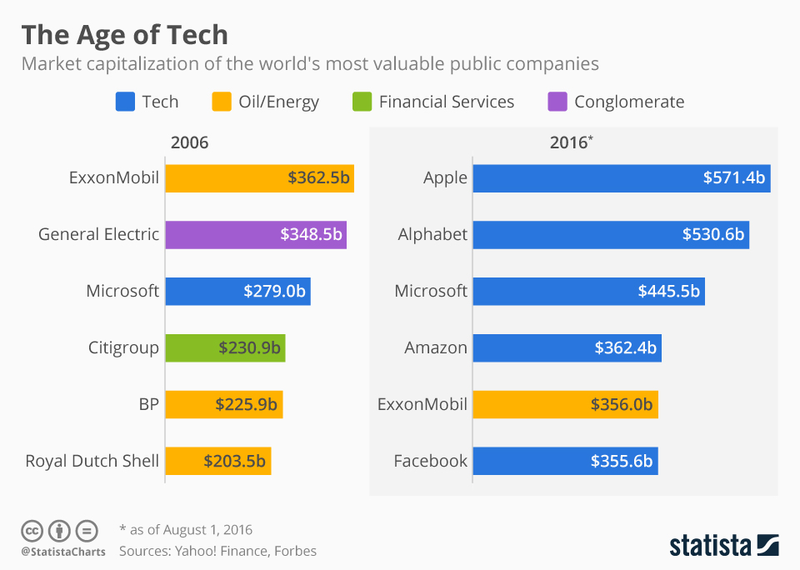 Many of the traditional technology infrastructure companies (Microsoft, IBM , etc.) are gearing up to ride the wave. Most blockchain technology companies also use Amazon’s AWS or Google’s GCP infrastructure to deploy blockchain. All of these platforms will see growth that will trickle down to your technology ETFs or mutual funds. However, for a more concentrated play, take a look at the GPU makers like Nvidia and AMD. The former was the best performing stock on the Nasdaq in 2016 and is up 78% YTD in 2017 as of today. 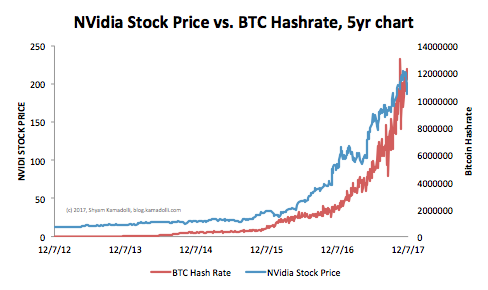 As an exercise I tried to map NVidia’s daily closing stock price over the past five years versus Bitcoin’s hashrate (which is a measure of the computational complexity of mining new coins). One advantage some of the GPU vendors have is that there is a trifecta of transformational technology (blockchain, AI/machine learning, and graphically intensive computing like gaming and VR/AR) that all leverage GPUs. So there is a theoretical built-in hedge against the risks of blockchain. Anybody (especially me) trying to break down blockchain investing into a rubric of any kind would be treading on thin ice; this is a complex ecosystem and that is rapidly evolving and I do not think anybody has a complete and well-informed view at once. But this post reflects my current thinking and I am constantly meeting amazing entrepreneurs, technologists, and visionaries that help me evolve my view frequently. The top layer in my framework is the most familiar to technology investors since traditional startup investing screens apply pretty well here: teams, product, market, and business-model. The first two cannot be generalized, but the last two can. Business models are a harder aspect of approaching opportunities because in this domain, they are usually untested and radical in their approach. All blockchain apps (should) try to be decentralized and trustless (hence generally called dapps for decentralized apps). That in and of itself is not what defines “disruptive” but the kind of impact they create is. This can usually be classified as one of three. Transformative: are they rewiring an existing use-case or ecosystem? rewriting the rules perhaps? I have seen a number of sharing economy transformation ideas (Uber?) on the blockchain where key impediments are no longer meaningful: “are suppliers employees or contractors” or “platform commissions are a drag”. Creative: are they doing what was previously not possible? Imagine a lender in negative-interest rate countries like Japan lending to a someone in a high-interest rate country like India (cross-border lending), or a network of bots that transact with each other while still maintaining the security and immutability of every transaction (Botchain). Destructive: there exist rent collecting monopolies and oligopolies at the center of many global transaction flows and these are being assailed by blockchain startups: card associations like Mastercard/Visa (Ripple), remittance gateways like SWIFT (Circle), credit bureaus (Bloom), etc. how does the token economy work? how is the initial pool of tokens being allocated? why will the value of tokens go up (if indeed that is how value is returned to investors)? why would miners/minters bother with creating blocks for this dapp instead of others. This takes some serious spreadsheet work beyond meeting the team and working through the higher level business model questions. As much as popular attention is focused on Bitcoin it is best to think of this cryptocurrency as an application that stores value running on top of the Bitcoin protocol. But the original blockchain protocol did not meet the needs of other applications that needed to exchange more than a single stored value for data. New protocols emerged to meet those needs. As applications get more sophisticated, the need for evolution of protocols increases and this creates some of most exciting investment opportunities at this time. Perhaps the best known evolutionary protocol value creation to date was the genesis of Ethereum (see Smart Contracts below) but there have been a number of other new protocols created like TenderMint, Ripple, and HyperLedger (a larger compilation here). Consensus: The process by which new blocks are added to a blockchain requires all participants to agree on a consensus protocol. While Bitcoin introduced the concept of “proof of work” and others like Ethereum have adopted it as well — the technique has been criticized for being wasteful of resources and for constrained transaction throughputs ( ~7 per second for BTC and ~20 per second for ETH ). Even after blocks are created, the changes to the ledger need to propagate and the blockchain needs to reorganize which can take a while (on the order of hours) — leading to unreasonably delayed settlements in transactions. These shortcomings (and others) are being addressed by some exciting new protocols. 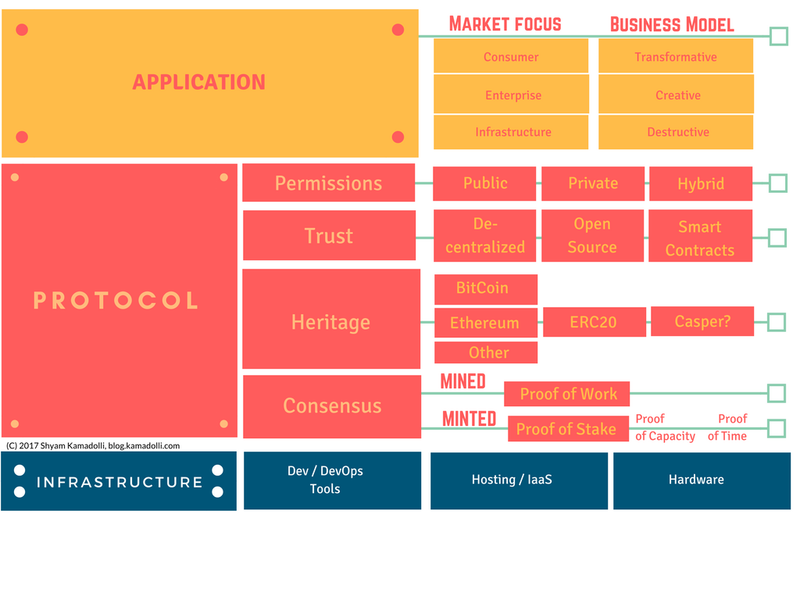 Heritage: While Bitcoin itself has evolved into a couple of variants, the limitations of storing only a piece of data (value) led others to build new protocols which also support so called “smart contracts”: the storage of blocks of code on the blockchain which can execute themselves (securely) when associated data meets certain conditions. Unlike previous generations of computing protocols like HTTP and SMTP that merely transmitted data from point to point, these new protocols also carry chunks of software associated with the data being transmitted and are hence called “fat”. A lot of the excitement around Ethereum is based on smart contracts. But another significant contribution from the Ethereum community has been the ERC20 specification which standardizes the way smart contracts are implemented. Most new protocols are compliant with this specification which allows applications to interoperate and for developers to gain generic skills that translate well from application to application. At its most basic level, ERC20 allows exchanges and wallets to work with any of these new applications that adhere to the standard. Permission: Early blockchains evolved to be “public” — anybody could join them. Over time use cases evolved (especially within enterprises) to limit access to some blockchains, which gave rise to so called “private” blockchains. Protocols have since then evolved to be “permissioned” — that is anybody with the right credentials can join the network, which is a hybrid between private and public chains. There is a lot of movement and evolution currently underway in the protocol layer. One of the strengths of the blockchain community is its ability to police itself; several new proposed protocols have been exposed for having security and logical vulnerabilities. The same community also fosters fervent debate about proposed changes to protocols. All the protocol debates can create friction, but I believe at this point in time, this is where most value is being created in the ecosystem, and informed investors can probably find the next Ethereum. Each of us will have to figure out what part of the stack we are most comfortable investing in, and when. And we all have to do the work we usually do (find the opportunities, apply the usual rigor), but then we also have to map them against a fast evolving frame-of-reference. Infrastructure plays of the legacy kind (Google, Microsoft, etc) are not pure-plays and are pretty rich in valuations already. And Infrastructure Startups need teams that excel at both IT infrastructure and Blockchain infrastructure and those are hard to find. But if you do, there are some real gems there. Applications (dapps) are of low quality as a cursory scan of Token Report will indicate; this is a low signal-to-noise-ratio sector and it requires both rigor and reach to find quality. And even when you do find them, the good dapps are sitting on the shifting sands of evolving protocols and infrastructure below them. To complicate matters, regulators for each domain (e.g. FINRA and the SEC for financial services) are projecting uncertain regulatory regimes overhead. Protocols are where most of the evolutionary action is and personally I would be looking for the best teams that can solve the hardest problems in blockchain: making scalable, secure, easy to use, protocols that can deliver on the promise of decentralized trustless computing. However, like everything else in the blockchain sector, things are not always clear cut. Many dapps are rolling out their own protocols (or “forks” of more established protocols) and protocols have developed coupled dapps. One exciting protocol example is IPFS and the associated storage application FileCoin. I hope we all march forth and prosper, but please do share your thoughts and comments with me — whatever I know, I learned from you! Minimally, please clap if you found this interesting!